nest Portsmouth - what nest offers UoP student/graduate entrepreneurs! We are here to help you get an idea off the ground, or take an existing startup to the next level. We offer expert advice and support, workshops, co-working space, networking opportunities and a whole host of useful resources. We’re here to help – at no cost to you and no loss of ownership: your idea is your idea. nest builders are collaborative, innovative, and ambitious forward thinkers. Whether you are a designer, engineer, social entrepreneur, artist, marketer, or small business leader, nest provides you with the tools and support you need to develop and grow. nest is for any University of Portsmouth student with ambitions to develop the next big thing, help others through business, or simply create their own job. nest is available to all current students at the University of Portsmouth and any graduates of the University within the last 5 years. If you have an idea, your first step is to discuss it with one of our team at a nest enterprise clinic which we run in the Careers and Employability Centre on Wednesdays 2pm-4pm or Fridays 9.30am-11.30am – simply turn up on the day. If you are unable to make it to an enterprise clinic please email us at nest@port.ac.uk to make an alternative arrangement. We also can arrange appointments via Skype or over the phone you are a distance learner or a recent graduate who is no longer in Portsmouth. RoutetoStartup involves 4 short workshops supplemented by ad-hoc specialist workshops, occasional meet-ups and one-to-one advice for funding, competition entry and launch. 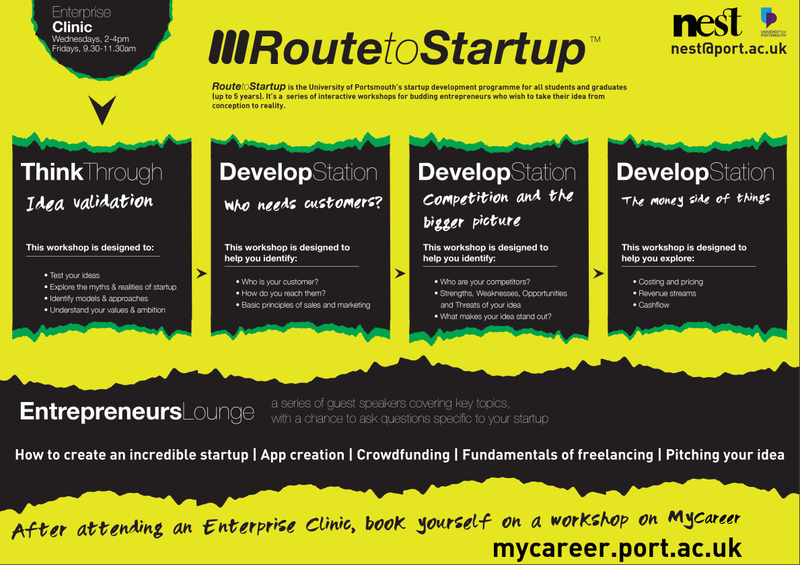 RoutetoStartup workshops run throughout the year, have a look at the events page to see when the next session is. nest isn’t just a place to come for workshops or advice, it also provides working space to develop your idea and collaborate with other entrepreneurs. Current students can register to use hot-desk facilities during office hours (9am-5pm Monday to Thursday, 9am-4pm Fridays). Email nest@port.ac.uk to register your interest. We also have other memberships for established student startups, which a member of the nest team will be happy to discuss with you. Graduates (within the last 5 years) can register to use the facilities on a discounted (paying rate). A Self-Employment Placement (SEP) may be undertaken by certain students currently studying at the University of Portsmouth. This will normally take place following the 2nd year of studies and where appropriate replaces the traditional placement year in industry. The aim of the SEP is to encourage the development of enterprise skills whilst starting-up and running a business or social enterprise or being self-employed during the placement year. How to Apply for a Self-Employment Placement If you are interested in finding out more about the Self-Employment Placement your first step is to come to a nest enterprise clinic. These are on Wednesdays 2-4pm and Fridays 9.30-11.30am in the Careers and Employability Centre. Also, don’t forget to contact your faculty placement office to register your interest. Non-UK & EU International students are generally not permitted to start a business whilst studying. However we can still support your startup development but you are not allowed to start trading. Your first step is to come to a nest enterprise clinic. These are on Wednesdays 2-4pm and Fridays 9.30-11.30am in the Careers and Employability Centre. Looking to start a business upon graduation in the UK? The Tier 1 Graduate Entrepreneur Visa is for non-EEA international graduates (currently on a Tier 4 Visa) who have a viable, genuine and credible business idea that they want to put into practice in the UK. The University of Portsmouth is one of the endorsing institutions for this visa, and requires applicants to meet the following criteria in full. Applicants must be students or graduates* of the University of Portsmouth. Full details of the process can be downloaded here. To start the process, a reminder that you need to come along to a nest enterprise clinic. These are on Wednesdays 2-4pm and Fridays 9.30-11.30am in the Careers and Employability Centre. Appointments to meet with one of the enterprise advisers can be made by emailing nest@port.ac.uk. * Graduates up to 5 years after graduation. The Enterprise Showcase is a fantastic opportunity for us to recognise and celebrate some of the amazing entrepreneurial talents of our students, graduates and staff on show at the University of Portsmouth. Thank you to all those who were involved in this year’s event. To find out more and see the highlights from 2018, click here.